Joy and blessings abound when we walk in fellowship with our heavenly Father. At times in life, though, we may not always live up to God’s will. Thankfully, God’s Word assures us of the forgiving nature of our heavenly Father. Knowing God as our forgiving Father and understanding how to live in alignment and harmony with Him enable us to enjoy the blessings He intends to share with His children. To build these truths into our heart, let’s look at the parable of the forgiving father, then further at the forgiving nature of our heavenly Father, and finally at how we can live in alignment and harmony with God, free of guilt or condemnation, even though we may fall short at times. Luke 15 records a parable Jesus Christ taught to impress the greatness of God’s love and forgiveness as a Father. The father, at the request of the younger son, gave both sons their inheritance. The younger son then took his inheritance and left to go waste it in reckless and loose living. This certainly was not the father’s will for his son, but the son had freedom of will to choose how he wanted to live. And he went and joined himself to a citizen of that country; and he sent him into his fields to feed swine [pigs]. His life-style had left him in great need. Having spent all his money by his indulgent and unrestrained living, he went to feed swine. In that day, feeding pigs was considered one of the most degrading jobs possible. The person who fed the swine was counted as one of the swine himself. He was considered untouchable and even lived with the swine. What a change from the life the younger son had enjoyed with his father! It says he “would fain,” or earnestly desired to, eat the husks that the swine did eat. This was the level of degradation to which he had sunk. It doesn’t say that he actually ate the husks though. Let’s look at the next few verses. And he arose, and came to his father…. He woke up, in a manner of speaking. He recognized that his life was far from what even the servants in his father’s house enjoyed. He realized that he had sinned and decided to go to his father to ask forgiveness and see if his father would hire him as a servant. He made the decision and then acted on it by going home. …But when he was yet a great way off, his father saw him, and had compassion, and ran, and fell on his neck, and kissed him. This verse beautifully illustrates the loving and forgiving nature of his father. When he was yet a great way off, his father saw him! His father wouldn’t have seen him if he hadn’t been looking for him. 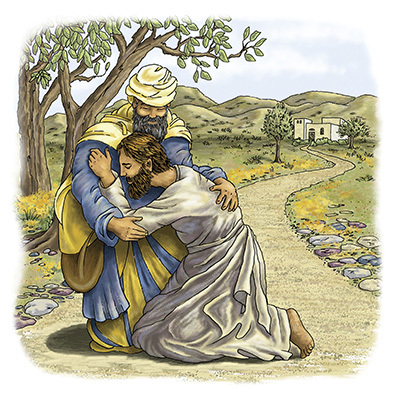 He had compassion on his son, and instead of waiting for him to arrive, the father ran to his son. Instead of lecturing the son about his poor decisions, he fell on his neck and kissed him. Let’s see what happened next. The father was so merciful and loving to his son. When his son went to him for forgiveness, he didn’t even let his son finish what he planned to say. After hearing his son acknowledge his error, the father called for the best robe, for a ring indicating authority in the household, and for shoes, which only a freeman would wear. All three requests showed that he was accepted back as a son rather than a servant. Then his father called for a celebration to rejoice at his younger son’s safe return home…. This is an excerpt from the May/June 2005 issue of The Way Magazine.